For what died the sons of Róisín if not for this? 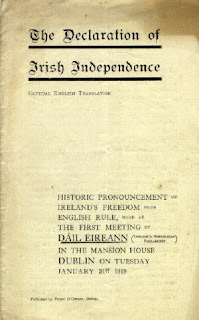 The Irish Republican position was never as strong as it was during the period when it had its own institutions under the first and second All Ireland Dáil Eireann and exercised its own laws. 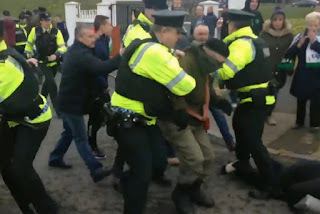 This was the ultimate expression of national sovereignty by the Irish people with institutions of our own creation designed for the purpose of improving the conditions of the Irish people as a whole. Without our own institutions, we cannot exercise our own sovereignty, and sovereignty you cannot exercise is not sovereignty at all. Despite this fact, the emphasis today among Republican groups and individuals seems to be focused on altering the conditions in the six county and twenty-six county states to improve the conditions for people to live under. While creating better social conditions for people to live with is worthwhile and its importance should not be downplayed in any way, it should not be done at the expense of creating the Republic we seek; where we ourselves will determine the type of society we have rather than have it decided for us by financial markets both at home and abroad. The focus of Republicans must be the re-establishment of the Irish Republic. Anything less will prolong the status quo and continue to deny the Irish people the right to exercise their sovereignty as they see fit. It is the duty of everyone who calls themselves a Republican to continually push towards the re-establishment of the Irish Republic. Ask yourself what does the Irish Republic mean to you and then ask yourself how you are contributing towards its reestablishment. Organisations that define themselves as Republican must also ask the same questions of themselves. Is their position one that merely gives rhetorical reference to the re-establishment of the Republic; or have they a plan to work towards the creation of the institutions required. The complexities involved in creating institutions such as these would be far beyond the scope of a blog post such as this, and making any attempt to do so would simply focus people’s minds away from the need for it to be done and instead focused on how it should be done which is putting the cart in front of the horse at this stage. Any movement forward on this would, however, have to be predicated on cast iron guarantees by all involved that there would be complete non-participation in institutions claiming sovereignty over the territory of the Irish Republic, i.e. Leinster House, Stormont, and Westminster. Without such commitments, the entire endeavour would be pointless and rightly open to criticism as a waste of time, energy and quite possibly the start of a slippery slope into constitutionalism. We want revolution, not reform. Irish unification is not the end goal for Republicans nor is the ending of the British occupation. These are steps that need to be taken but our ultimate objective has and always will be the re-establishment of the Irish Republic. Brilliant piece, maith the a cara!! A laudable sentiment but, I am sorry to say, that is all it is. The author argues: "The complexities involved in creating institutions such as these would be far beyond the scope of a blog post such as this, and making any attempt to do so would simply focus people’s minds away from the need for it to be done and instead focused on how it should be done which is putting the cart in front of the horse at this stage." How it should be done is the essential item in this equation for, unless we have a road mapped out we cannot hope to attract any support for the re-establishment of the Republic. I suspect that the real reason the author waxes shy when the need to say "how" arises is not so much the constraints of a short blog piece but rather that he does not have a plan, nor even the beginnings of a plan. In that case would it not be best to just say that he does not have a plan and call for the formation of a body of like-minded people to help formulate a plan ? 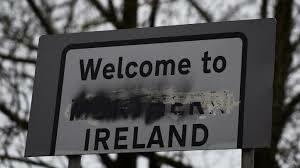 I usually find myself extremely reluctant to use the term "Republic of Ireland" to describe the political set-up in the 26 counties and have often instead referred disparagingly to that state as, "The Free State". However I am aware that that is a childishly abusive term so, rather than call it the Republic OF Ireland, which I insist it most certainly is not, I have resolved to refer in future to the 26 counties state as "The Republic IN Ireland" as it is after all A republic and it certainly is in part of Ireland, if not THE Republic proclaimed in 1916. I would like to thank you Rory for the feedback on the article which is appreciated. I have to say though that I did laugh when I first read it but not for the reason you may think. When I first began writing the piece I had intended to keep it a good bit briefer and I specifically wanted to steer clear of any mention of the "how" for a number of reasons. Firstly it would be beyond the abilities of one individual (despite being as gifted as I am, and clearly modest)to properly articulate the formation of an entirely new governmental structures for an entire country in a blog post. I do have a number of proposals on the "how" side of the debate but I considered these best put forward at a later stage in a body similar to your own suggestion "of a body of like-minded people to help formulate a plan". The reason for this is that it is preferable to have those engaging in this come to agreement themselves on the steps to be taken rather than try and get people to come on board and support ideas they themselves had no hand act or part in deciding. The second reason which was the most important one when writing the piece was that I knew that as soon as I mentioned the how, that people would focus on that like moths to a flame and completely ignore what I was trying to get across in the piece, and that is why I laughed when I read your reply. To ignore the first piece renders the second entirely redundant. If you cant get agreement that it should be done then how it should be done no longer has any meaning. As I said earlier I had intended leaving all mention of it out but it was suggested to me to essentially flesh the piece out a little bit more and I thought I may just have managed to avoid the issues in relation to that with the little bit extra I added but you have proven me wrong on that count. There are two things I would take issue with in your reply however. Firstly when you wrote "unless we have a road mapped out we cannot hope to attract any support for the re-establishment of the Republic". I dont believe we should be sitting back waiting for someone else to come along and map things out for us. As republicans we have to push forward ourselves and make sure we are the ones who think up and articulate the ideas. And secondly its your references to the free state, although its not so much that I take issue with it, its more that I am unsure of the relevance of that in relation to the piece I wrote.